Holiday traditions are very near and dear to my heart. It all starts at Thanksgiving, when I bust out classic recipes from my grandmother’s recipe box and my family ends the night with stories from the past. Do you have a holiday tradition that you cherish and look forward to every year? Toffee is an important part of my family’s collection of holiday traditions. The buttery flavor that’s reminiscent of molasses, the chocolate that melts on your tongue, and the crunch and snap of the candy – all of these sensations bring the holidays to life for us. And of course, I don’t want anyone to have to miss out. 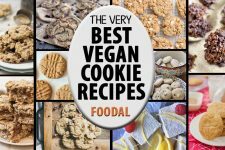 I decided to make a vegan version to make this treat dairy-free, and ready for gifting to just about everyone in my life. 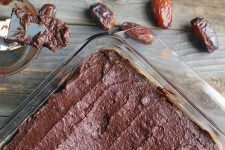 Making vegan toffee is relatively easy, as long as you keep an eye on it while it cooks. 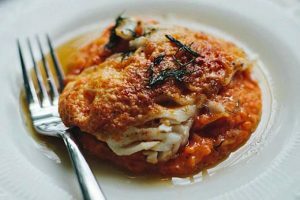 The most important thing you have to do is make sure that you are using a recipe that definitely works. I cannot emphasize this enough. And I can promise you that this recipe one hundred percent does. 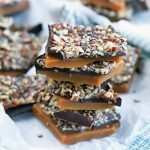 Toffee is sensitive to substitutions, and the ratio of the ingredients in this recipe are pure magic, with stellar results. Just be sure to always keep an eye on the sugar and margarine mixture while it’s cooking so it doesn’t burn. Almost as if by magic, that rich, buttery flavor comes through without using actual butter. 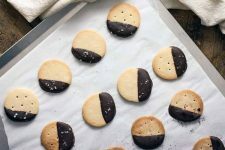 The dark chocolate provides a bitter note to contrast with the sweet candy that lingers on your tongue in the most delightful way. 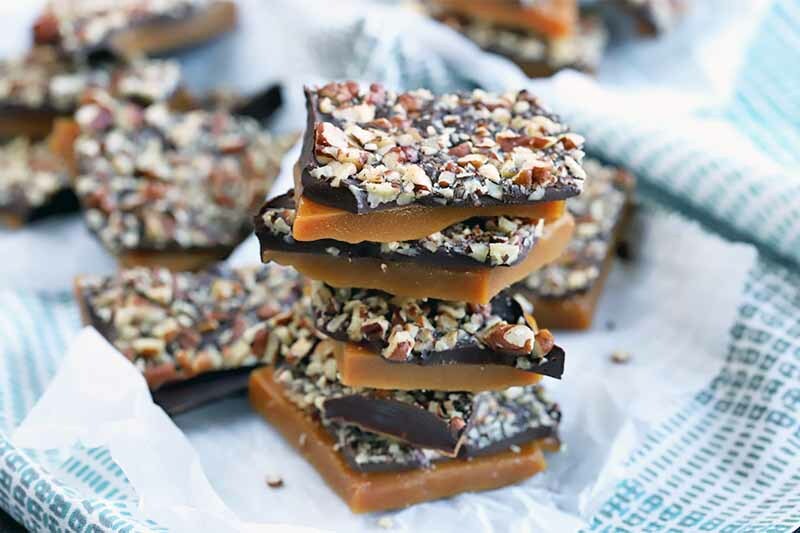 The toasted pecans and the snap of the toffee are just like what my grandmother would make, and just as darn tasty. 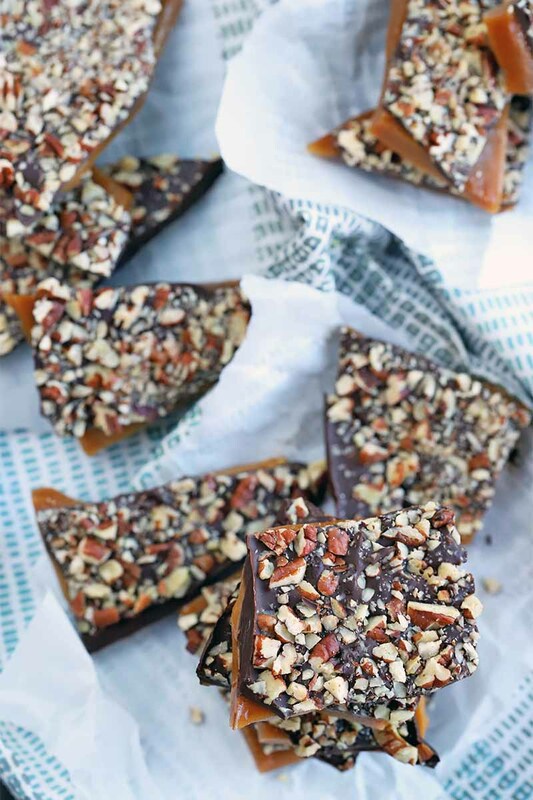 When you give the gift of a tin filled with this vegan chocolate pecan toffee, know that the recipient’s eyes will go wide at the first taste of it. 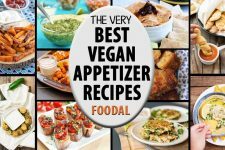 Honestly, I bet they will be asking you if it’s really a vegan recipe. And it is! Making candy like this and sharing the treats with loved ones is one of my favorite things to do throughout the holiday season. 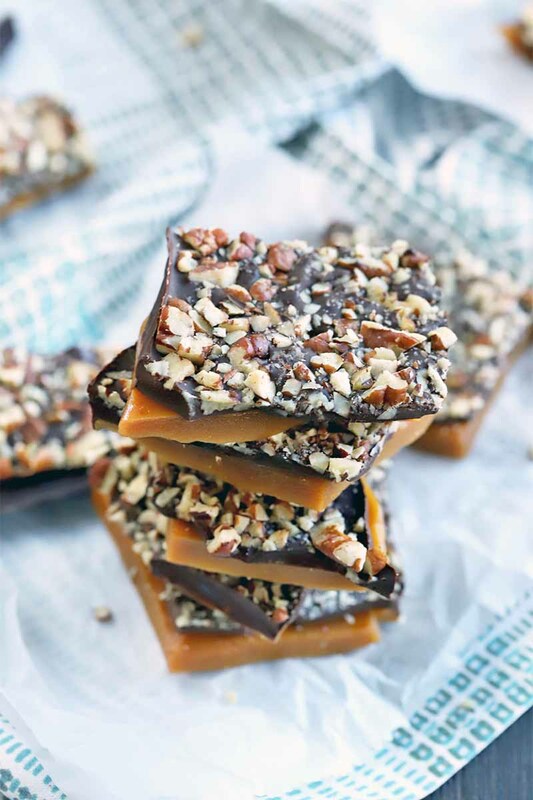 Gathering around the table with a plate of this candy and mugs of hot coffee is one of my favorite ways to create memories, and spend quality time with my family and friends. It’s so delicious I’m willing to bet you will have a hard time convincing yourself to stop eating it. Trust me on this one. The “just one more piece” urge is real! 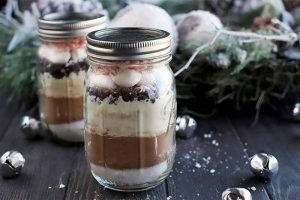 I know I say it’s a fantastic gift, but you might want to consider making a double batch because you are going to want to keep at least a few pieces of this magical candy for yourself. If you need a recommendation for how to maximize your enjoyment of this sweet snack, you should make yourself a latte or big mug of coffee. 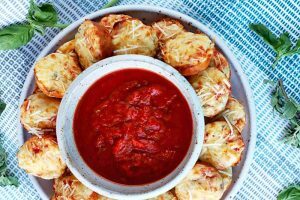 Then, set out a plate full of pieces of this delicious treat and nibble while you do whatever makes you happiest during the holidays. The flavor of the candy alongside a slightly bitter coffee drink is the best combination your taste buds can experience at this festive time of year. 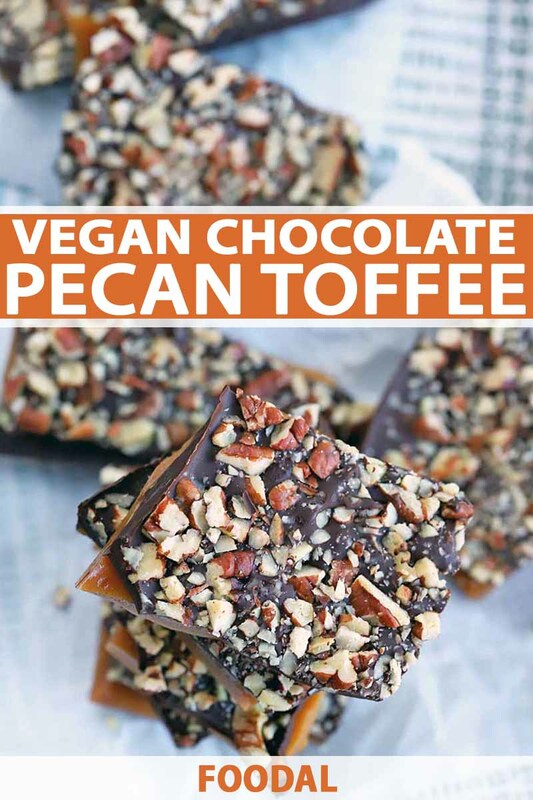 For a superb gift for friends and family, bring out the best vegan chocolate pecan toffee recipe. It’s the ideal blend of sweet and salty. Read more now. 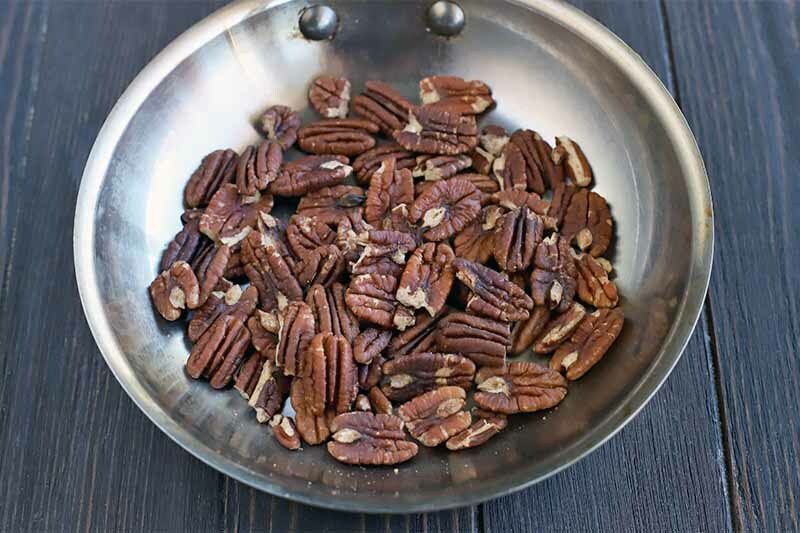 Toast the pecans for a few minutes in a skillet on the stove over medium heat, until fragrant. Remove from the pan and set aside. Finely chop when they are cool. 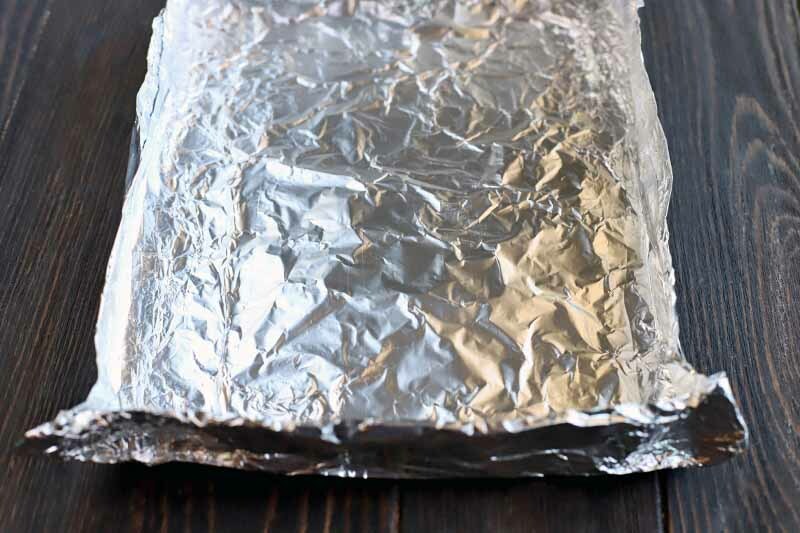 Make a 10-inch-square shell out of aluminum foil, with sides that are 1 inch high. You can find more detailed instructions for doing this below. 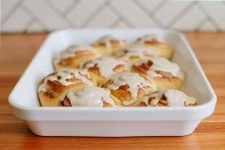 Place on a baking sheet and set aside. 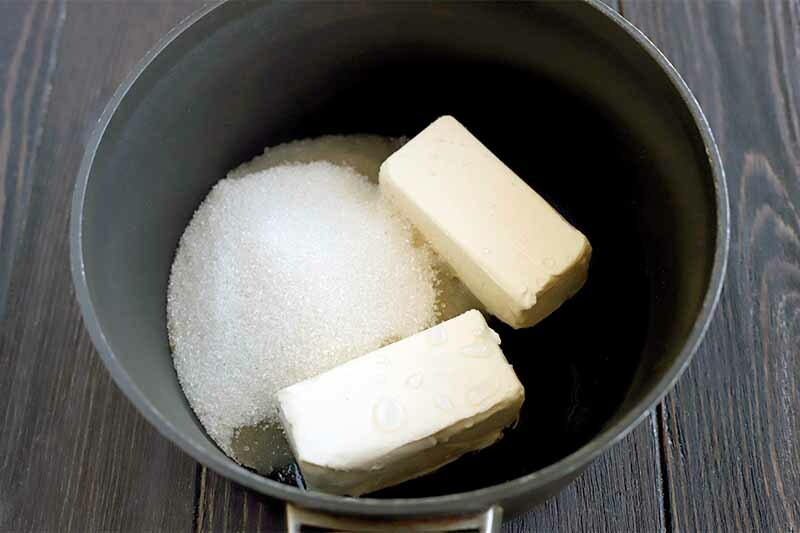 Combine the sugar, margarine, and water in a saucepan and place over medium heat. Stir constantly, until the margarine is melted. Test with a candy thermometer and let the mixture cook until it reaches exactly 305˚F, the “hard crack” stage. Watch it carefully – you cannot let the mixture go above 305˚F. Remove from the heat immediately and stir in the vanilla and salt. Pour into the foil shell. 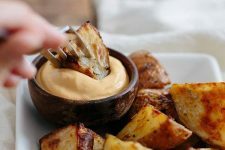 The mixture will spread, but don’t worry if it does not reach the sides. Allow to cool for at least 45 minutes at room temperature, or until hardened and cooled completely. 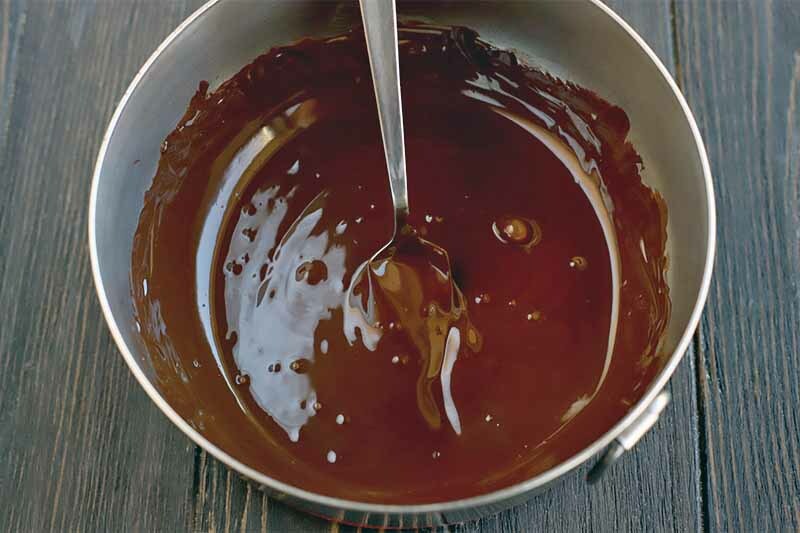 In a double boiler, melt the chocolate over medium heat. 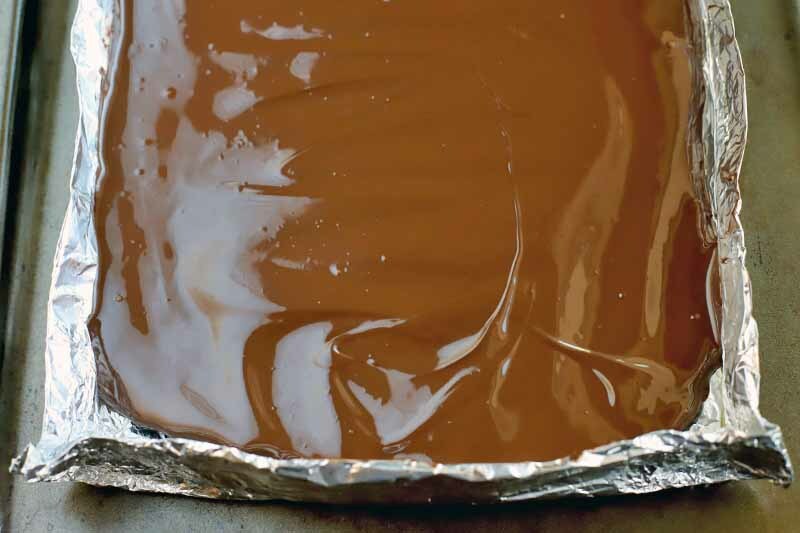 When very smooth and melted, pour over the top of the toffee mixture. 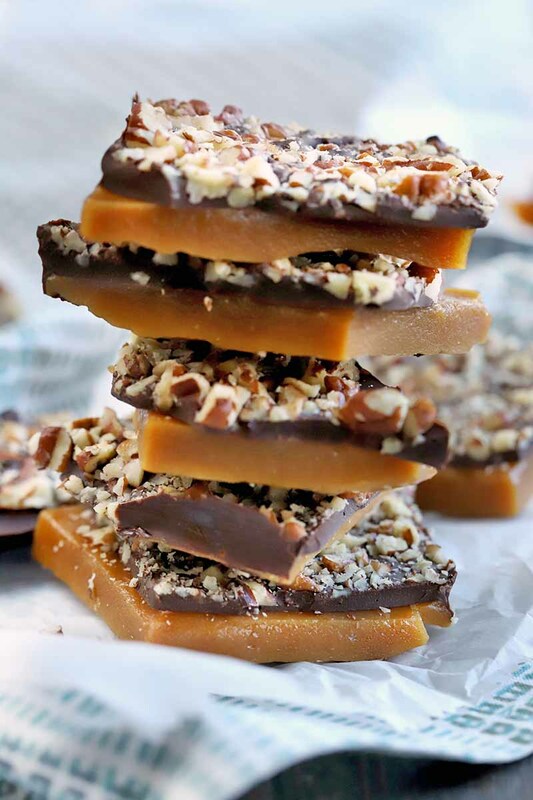 Use an icing spreader or or knife to smooth the top and cover the toffee. Sprinkle the nuts on top, pressing down slightly to ensure they adhere. 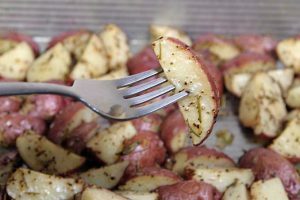 Place in the refrigerator to cool and harden completely, about 30 minutes. 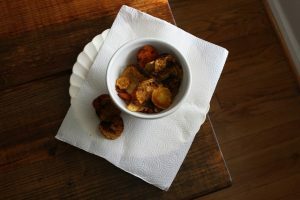 When ready to serve, break into single-serving-sized pieces, about 1 1/2 to 2 inches long. Measure out all of the ingredients at listed in the ingredients list. 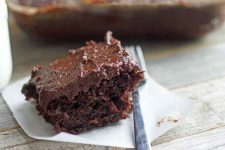 Make sure you use organic, unbleached sugar to keep the recipe vegan. The only ingredient listed should be cane sugar, processed without the use of any animal products. Set ingredients and all necessary equipment out in the order they are listed to make it easier to find what you need as you move through the recipe. Heat a medium-sized skillet over medium heat. Add the pecans and toast, tossing occasionally until fragrant, about 3-5 minutes. 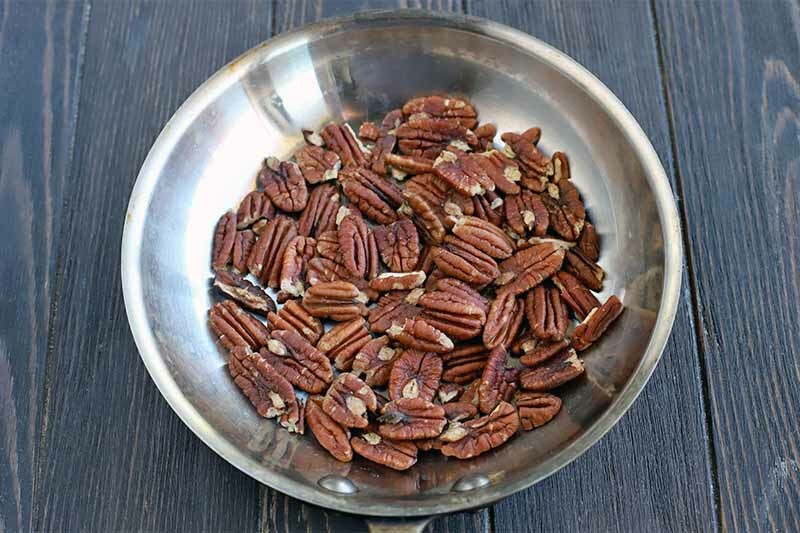 Start with raw, unsalted pecans, either halves, a mixture of pieces and halves, or whole nuts that you have shelled yourself. Be sure to keep an eye on them, because they will go from golden brown to burnt very quickly. 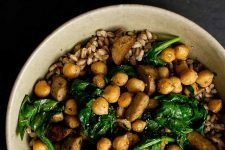 Remove from pan and set aside to cool at room temperature. Chop the pecans once they are cool enough to handle. 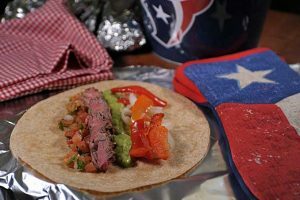 Make a 10-inch-square shell out of aluminum foil, with sides that are 1 inch high. To do this, start with a piece of aluminum foil that is about 12 inches wide and 12 inches long. On two opposite sides, fold 1 inch of the foil over to make a border on both sides. Do the same with the other two sides. Pull the folded 1-inch sides up and crease so they stand up. Fold each corner out to make a little peak that pokes out from the shell. 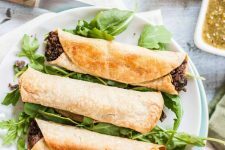 Place the foil shell on a baking sheet and set aside. 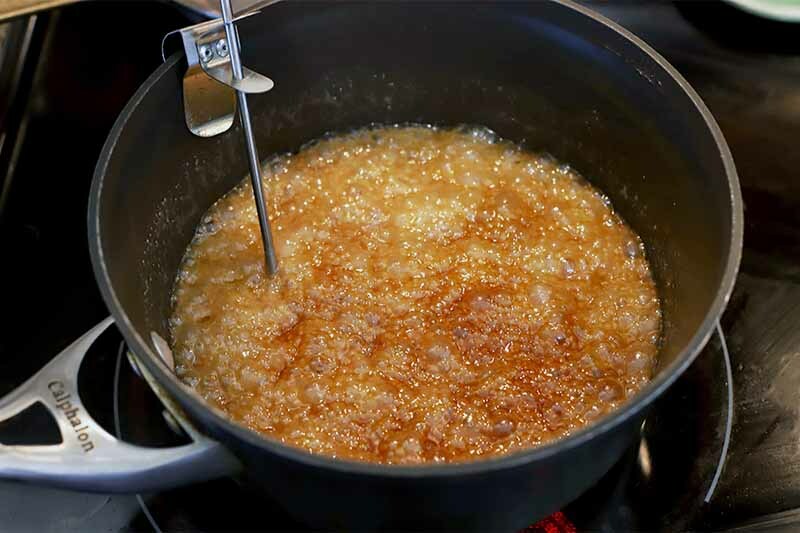 To make the toffee, add the sugar, margarine, and water to a saucepan and place it on the stove over medium heat. Stir until the margarine has melted completely. 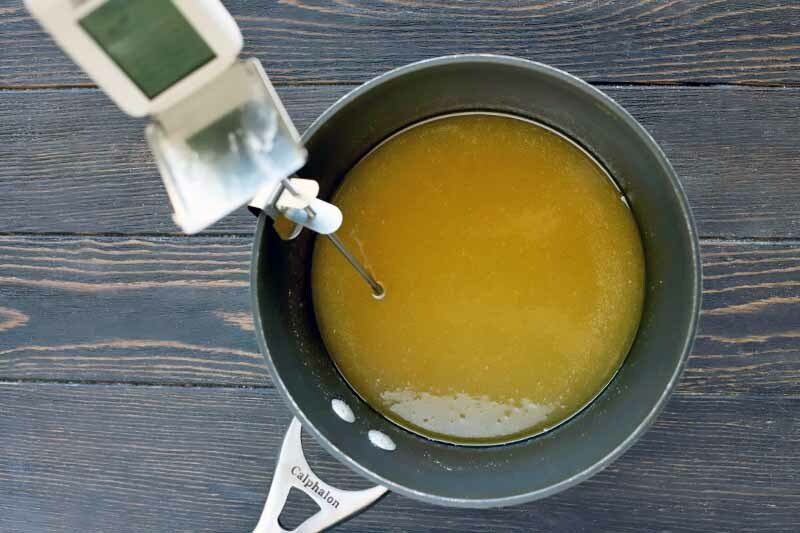 Using a candy thermometer, watch the temperature and let the mixture cook without stirring until it reaches 305˚F. This is the “hard crack” stage. Watch it carefully so the mixture doesn’t get above this temperature. The sugar mixture will be thick and the color should be a rich almond brown at this stage. If you let the mixture go over this temperature, the toffee base will burn and it will not harden like it’s supposed to. Remove from the heat as soon as the mixture reaches exactly 305˚F, and stir in the vanilla and salt. 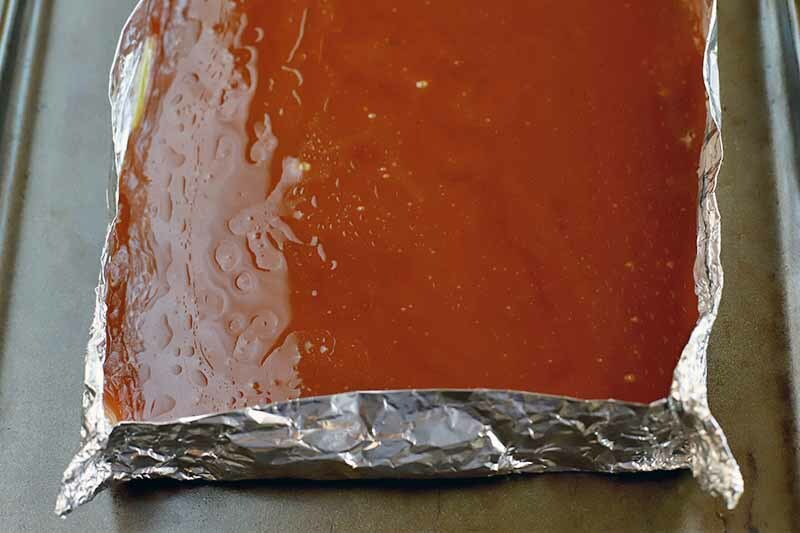 Pour the mixture quickly and carefully into your foil shell. It will spread, but don’t worry about whether or not it reaches all of the sides. There’s no need to spread or smooth it. 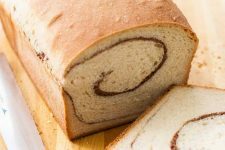 Allow it to cool for at least 45 minutes at room temperature, until hardened and cooled completely. 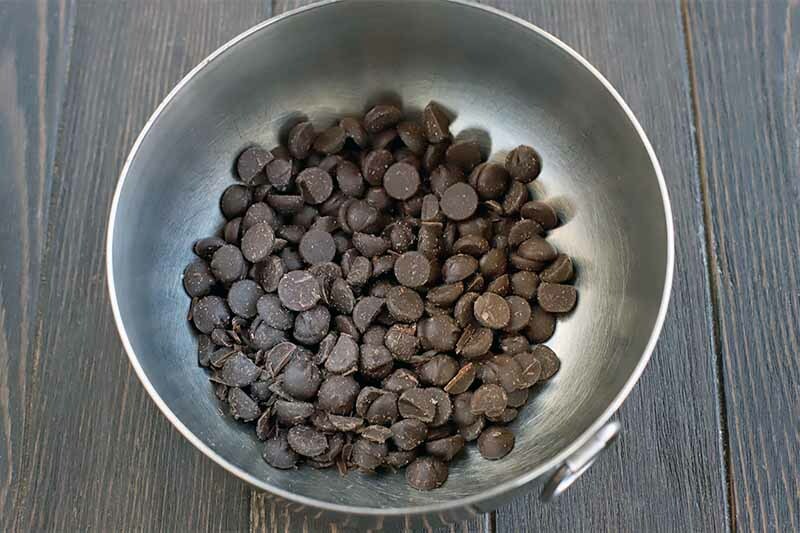 Add the chocolate to the top bowl of a double boiler with about an inch or two of water boiling in the bottom. If you do not have a double boiler, you can use a heat-proof mixing bowl set into a saucepan – just be sure that the bottom of the bowl does not touch the boiling water. Melt the chocolate over medium heat, stirring occasionally. Keep an eye on it and do not leave it on the heat for too long, to avoid seizing. When smooth and melted, pour it over the top of the toffee mixture. Use an icing spreader, offset spatula, or a knife to smooth the top and cover the surface of the candy. 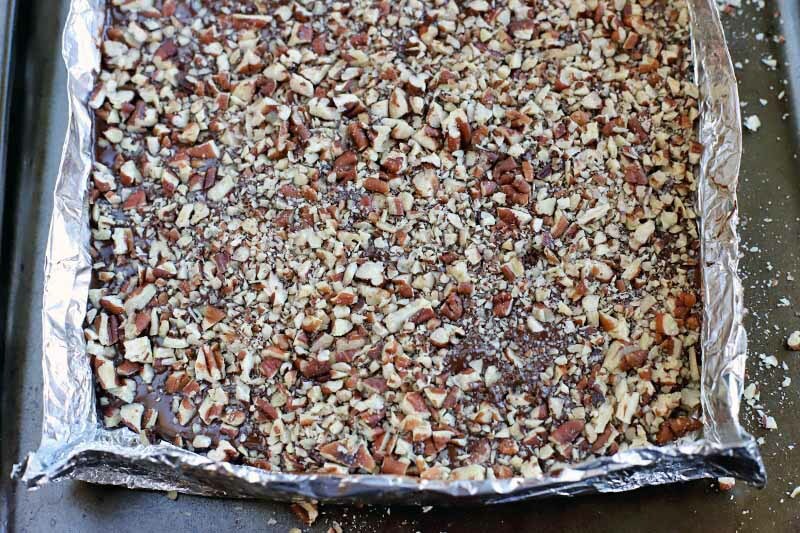 Sprinkle the toasted nuts on top, pressing down very lightly, just enough to ensure they adhere. Place in the refrigerator to cool completely. 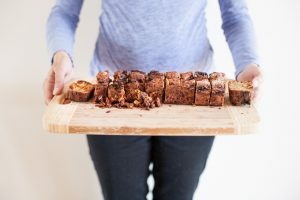 When ready to serve, break into pieces that are about 1 1/2 to 2 inches long. What, Are You Nuts? Yes, You Can Use Other Types! 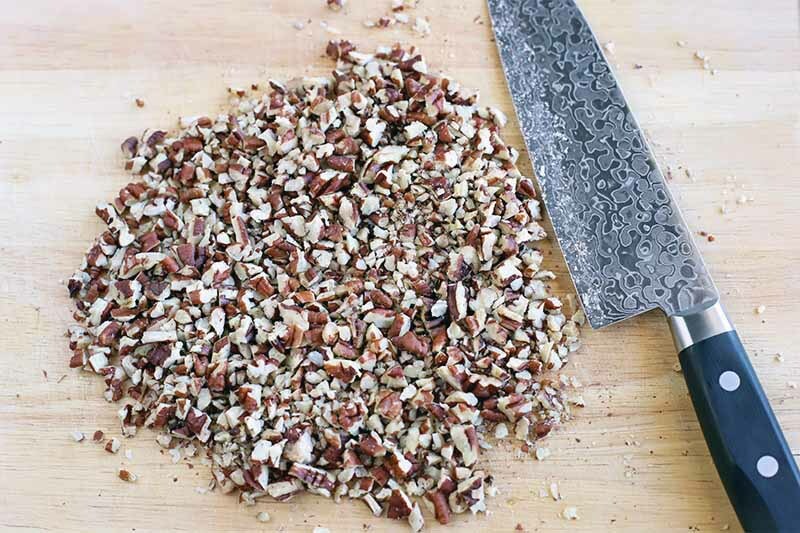 If you don’t like pecans, you can certainly use another type of nut if you prefer. 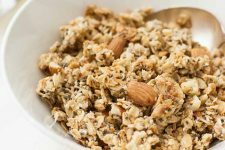 I would recommend using either almonds or walnuts as a substitute. Pecans, macadamia nuts, or hazelnuts would also be delicious, depending on your preference. 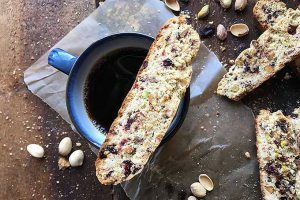 You can use the same amount as listed in the ingredients list for pecans for this substitution, just make sure they are raw and unsalted so you can toast them before chopping. And if your loved ones are nut-free, skip this step! You can skip the chocolate as well, if you choose. 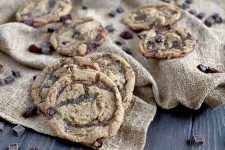 The toffee is also delicious on its own, perfect for us in other recipes like this one for Vegan Toffee Chocolate Cookies. Broken up into small pieces, it makes a tasty addition to homemade ice cream. Who will you gift this toffee to, or will you keep it all for yourself? Tell us in the comments below and be sure to rate the recipe when you try it to let other readers know how much you loved it!